Oral care is important for all dogs and proper oral health care can help your dog live a longer and healthier life free of the pain caused by dental disease. Brushing your dog’s teeth is still considered the standard in oral care. But not all dogs are really that fond of having their teeth brushed. So, what do you do when you can’t brush your dog’s teeth? Greenies Dental Chews may be the answer. Greenies Dental Chews are treats which are completely edible. They are “tailored to how a dog’s mouth actually bites and chews” so that they help control plaque and tartar build-up on your dog’s teeth. While they do not replace brushing as the “standard of care” in oral health care, they are a viable alternative for pet owners who are simply unable to brush their dog’s teeth. They can also be used to supplement tooth brushing as a means of keeping your dog’s mouth healthy. Greenies Dental Chews carry the Veterinary Oral Health Council (VOHC) Seal of Acceptance. The Veterinary Oral Health Council is an organization which recognizes products that meet pre-set standards of plaque and calculus (tartar) control in dogs and cats. The VOHC Seal of Acceptance is awarded to products, like Greenies Dental Chews, that have proven to be safe and effective. Besides being good for your dog’s teeth, Greenies Dental Chews also contain a mix of vitamins and minerals that supplement your dog’s health as well as antioxidants and fiber. They are highly digestible and most dogs appear to enjoy the flavor and texture of the treats. As a veterinarian, I recommend Greenies Dental Chews to many of my clients and I do believe they work. Dogs that receive them frequently often have healthier mouths than those dogs that are receiving no dental health care at home. As with any other product, pet owners should read all label directions before giving Greenies Dental Chews to their dogs and follow the directions carefully. You should choose the Greenies Dental Chew product that corresponds to your dog’s weight range. They are not suitable for very small dogs (less than 5 pounds) or for dogs less than six months of age. You should observe your dog when giving Greenies Dental Chews. Chews that are gulped rather than chewed can be dangerous for your dog. 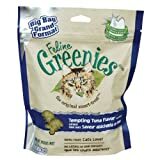 Feline Greenies Treats are a highly nutritious chew and treat. Proven effective in preventing buildup of dental plaque, tartar and strengthening gums. Provides a healthy formula with added vitamins, minerals and taurine. Low calorie. Freshens breath. 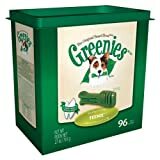 Greenies dental chews are the first dental chew that is tailored to how a dog’s mouth actually bites and chews. Five different sizes, each with different chewy textures to better serve all kinds of dogs. Greenies dental chews are 100% edible which means that there isn’t anything in it that your dog can’t eat and enjoy. Your Dog’s body can absorb and use all those good vitamins and minerals that we’ve added to the formula! Greenies dental chews are 96% digestible. 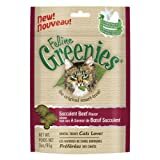 Greenies dental chews are easy to digest and highly soluble (that means that they break down easily in the digestion process). 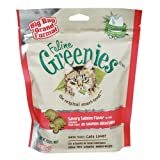 Find more Greenies Dental Treats products on Amazon!